Casa Rolando began as a vacation home for the Donato family. Over the years, it has developed into an internationally renowned guest house that has accommodated family, friends, and travelers from around the world. The house is nestled in Colonia Alta Vista, a traditional Mexican neighborhood in the lower reaches of the Sierra Madre mountain range. 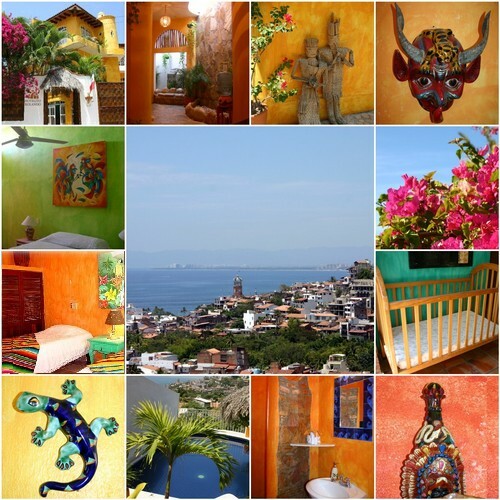 Casa Rolando overlooks Old Town Vallarta and the ocean on one side, with a back view of the jungle. We are in an ideal location, exactly 6.5 blocks from the popular Los Muertos beach, 2 blocks from the famous restaurants of Calle Basilio Badillo, and a ten minute walk to the famous Oceanside Malecon (promenade). Casa Rolando offers 10 uniquely themed bedrooms. There are also two common half baths, and a full-service kitchen for cooking parties. Facing the ocean and overlooking the city, there is a large deck area on the west end of the property, with a spectacular view. This area features an outdoor cooking facility with a pool-side aqua bar, and lounge chairs along the deck with two large palapas for shade. For reading and relaxation, we offer a rooftop terrace that is also used for our in-house massages. We offer making arrangements for whale-watching, zip-lining, horseback riding, fishing, snorkeling, sightseeing, hiking, surfing, tequila tours, and more. We also have an authentic, in-house Mexican cook for hire. Our goal is for our guests to experience the comfort and hospitality of Casa Rolando, and to take in the true warmth of Puerto Vallarta, Mexico. Note: Please note that Puerto Vallarta is a hilly place. Getting to the Casa is definitely manageable as long as you're in average health condition and mobility. Please check our location map.